2 Looking to buy a Kabuto helmet? 10 Other stuff – fasteners, build quality, buffeting, ACU gold, chin curtain & breath guard. 12 Alternatives to the Kabuto RT-33? 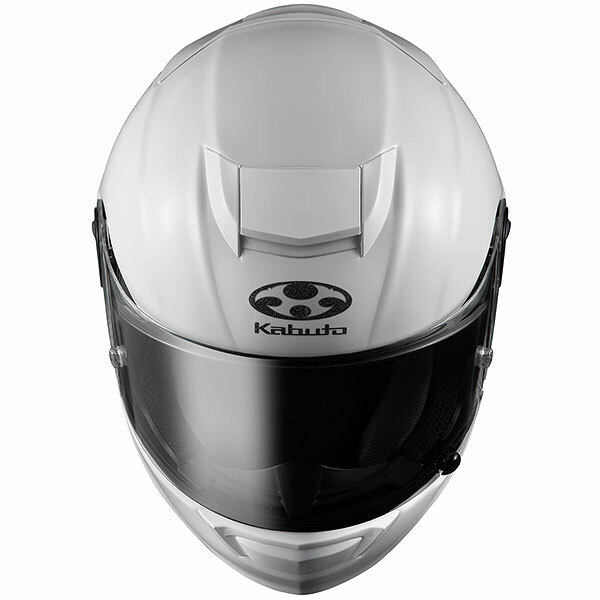 13 Best place to buy a Kabuto crash helmet? 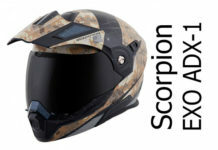 Kabuto RT-33 review – a SHARP 4 star composite fibre full-face helmet. For those not familiar with the Kabuto name, they’re the new name of helmet maker OGK who’ve been making crash helmets since the 80’s (apparently a Kabuto is the name of the traditional Samurai headwear). 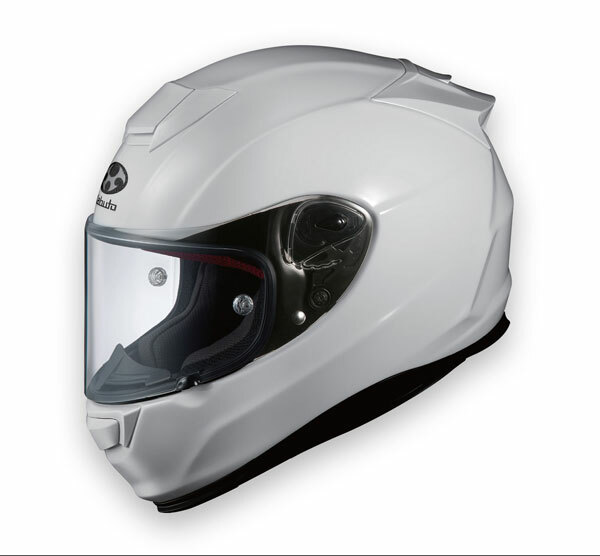 The Kabuto RT-33 is a composite-fibre full face helmet aimed at sports bike riders. The Kabuto RT33 is both EU ECE 2205 and US DOT certified – and it’s also been tested by SHARP and awarded 4 stars. That SHARP score is important as it means the RT-33 should offer a good level of protection in an accident – as well as allowing us to compare the RT-33’s safety performance with other helmets. 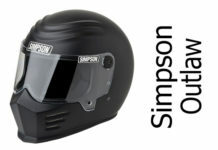 Follow the link to find reviews of other four and five star SHARP rated crash helmets. The shell is made out of a fibreglass-based composite material and comes in two different shell sizes. Though no details are available from Kabuto, that usually means the smaller shell size covers XS-M with the larger shell size covering L-XL. Read why more shell sizes may contribute to safety here. The RT-33 also comes with a Pinlock Max Vision in the box – having a fog-free visor is obviously important for safety – and it’s fastened with a good ole fashioned double-d ring fastener. They can be a bit fiddly at times but have worked well keeping helmets in place for decades. 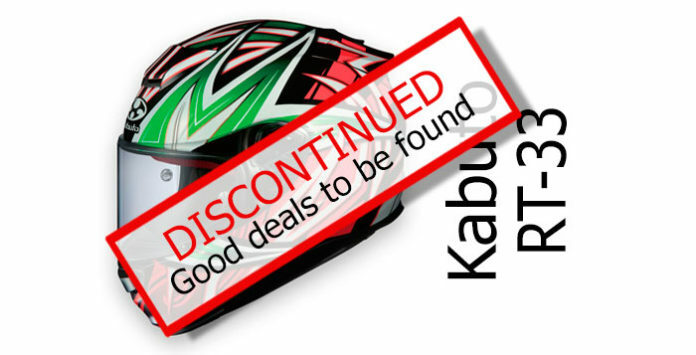 Looking to buy a Kabuto helmet? We recommend SportsBikeShop (UK) for outstanding service. 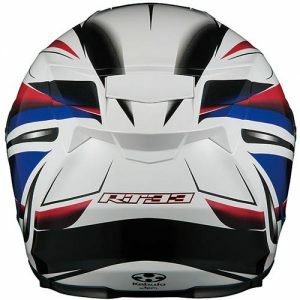 Please click the link to see their full range of Kabuto helmets and latest prices. Unusually for a more sports-biased crash helmet, the RT-33 is a pretty quiet helmet. Sports lids tend to prioritise things like better ventilation and lighter weight over noise-suppression. But the RT33 is widely regarded by owners as one of the quieter helmets around. Opening the vents doesn’t seem to increase noise very much and while we always recommend riding with ear plugs in, the Kabuto RT-33s slippery shape and excellent internal padding seems to contribute to making a quiet helmet. I guess those development hours spent in the wind tunnel have paid off for Kabuto! The Kabuto RT-33 is made in two shell sizes and fitment sizes range from XS-XL. Ventilation is another strong point for the RT33. It has a single chin vent operated by a slider that’s easy to find and use, even in gloves. In fact all the vents are nice and simple to use and large enough to be found with gloved hands. The top vent is another easy-to-find slider and there’s a large single rear exhaust vent that can also be opened/closed. So as far as operation is concerned, things couldn’t be much simpler. According to owners, all those vents do a decent job in pulling a good amount of air through the helmet too, taking air through the vents and into the channels in the shock absorbing internal liner and keeping the head cool in all but the hottest weather. Couple the chin vent with the Pinlock MaxVision insert that’s included in the box and the front vent works well in keeping the visor clear too when things cool down or it gets rainy. There’s not much fancy going on with the main visor – no sun visor or optically-correct visor here. But what it does do is cover all the basics very well. The RT-33s visor has a decent aperture size, is Pinlock-ready (with a Pinlock in the box) has a nice positive ratchet system and one of the best quick-release mechanisms around. In fully closed position, there’s a small snap-lock to the bottom left that’s designed to keep the visor locked closed (much like Arai’s system). Once you’ve got the hang of it, to open the visor, you simply push up on the snap lock and that disengages it and opens the visor. It becomes very easy and second nature so you eventually don’t even realise you’re unlocking at the same time as opening. The Max Vision insert is good because when you’re using this helmet as it’s meant to be used – i.e. in a more sporty tuck position – the top of a standard Pinlock can sometimes get in your line of sight. With the Max Vision being much larger, you shouldn’t have a problem. It also offers 100% UV protection – so there’s an added benefit for using it not only when it’s cold and wet! The liner of the Kabuto RT-33 is removable and washable and created from CoolMax material, designed to keep the head cool and wick away sweat. It’s also got a glasses groove in it. That means there’s a groove where the cheek pads meet the upper lining, which the stems of glasses sit in when riding, stopping them pressing into the side of your head. A glasses groove doesn’t always mean it’s easy to get your glasses on though. That’s usually more dependent on how straight or bent the ends are – but once they’re on, it helps making riding with glasses much more comfortable. 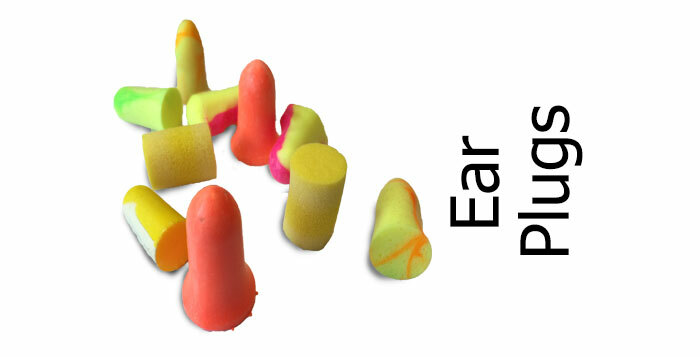 But arguably even more importantly than that – riders reckon the lining feels plush, insulates the ears well from noise and is very comfortable, even when riding for hours. As always, that’s only if you get the fitment right in the first place – read our helmet fitting guide. One other thing that can contribute to comfort is weight – and the RT33s composite fibre shell means not only is it strong, but composite fibre helmets tend to be lighter too – sitting somewhere between fibreglass and carbon helmets. The RT33 weighs in around 1.47Kg – putting it just 100g over the average weight of all composite fibre helmets and bang on the average weight of all SHARP tested full face crash helmets. 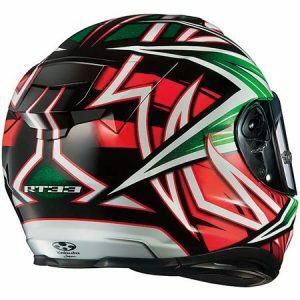 The Kabuto RT33 is available in a range of solid colours – gloss white/black/red and matt black – as well as their very much more in-your-face Veloce and Rapid designs. As usual, you’ll find pictures of most/all these around the page, but to check out the latest colours and designs (and prices) you’re probably best clicking through to our recommended retailers – and you can find out why you should use our recommended retailers here. Other stuff – fasteners, build quality, buffeting, ACU gold, chin curtain & breath guard. The RT-33 comes with a double-d fastener – they’re good solid fasteners though generally not as easy to use as the latest micrometric fasteners. Build quality on the Kabuto RT-33 is very good with owners saying the paint finish and attention to detail is of high quality. Kabuto designed the side of the helmet with what they call their Wake Stabilizer. This is designed to reduce buffeting and turbulence caused as the helmet cuts through the air. Owners thoughts seem to be that the RT33 is pretty good for buffeting though arguably no better than many helmets and buffeting certainly can occur in some circumstances (much like it can with most helmets!). In the UK, your RT-33 should be delivered with an ACU gold sticker on the back meaning it’s suitable for track use. If that’s important to you, you might want to double check with the retailer first as it’s up to the distributor to add the sticker. Finally, also in the box are a removable chin curtain and breath guard. Alternatives to the Kabuto RT-33? One obvious alternative is AGVs great Corsa that can be had for just a little more than the Kabuto. The Corsa is a SHARP 5 star rated sports helmet that’s lighter than the RT-33 and comes with an optically-correct visor. Or for something a little different, how about Schuberth’s excellent sports-focused SR-1 – that’s another composite fibre four star helmet with good ventilation. 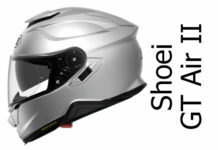 Finally, you might want to look at the Shoei X-Spirit II – that was Shoei’s top of the range sports helmet until the X-Sprit III came along – meaning you can now get a discounted SHARP four star X-Spirit II for around the same money as the Kabuto. Worth a look? Best place to buy a Kabuto crash helmet? If you want excellent service and piece of mind when you buy, we recommend you buy from Sportsbikeshop. They're based in the UK and offer outstanding service (9.8/10 on Trustpilot) including 365 day refunds and free returns. 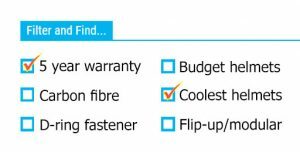 They're not always the cheapest but are our recommended retailer for quality of service. Read more on why we recommend Sportsbikeshop. Please click the picture below to visit the Kabuto helmets page at Sportsbikeshop where you can see all the latest colour schemes and prices. And if you buy from there, we get a small sum from the sale at no extra cost to you - a massive THANKS! (it's how we finance the site). The Kabuto RT-33 is a very competent crash helmet. 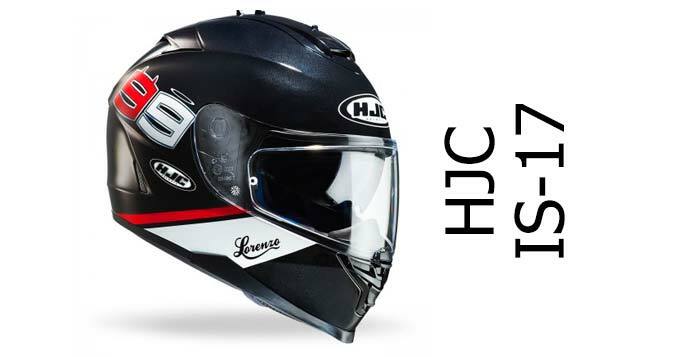 Although it might lack some of the latest features and bells and whistles of some alternatives, it has a solid SHARP 4 star safety rating, it’s very comfortable, has excellent ventilation and is one of the quietest full face helmets out there. 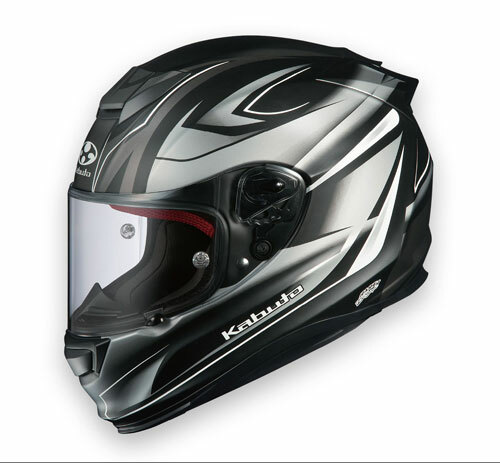 It’s also well finished and while it’s not the cheapest helmet, if you’re looking for a more sports-focused great performing helmet, then the Kabuto shouldn’t disappoint. 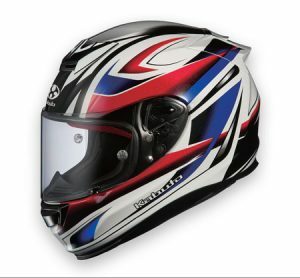 The Kabuto RT-33 is a SHARP 4 star safety rated composite full-face helmet that does everything well. Ventilation, noise, comfort, finish - and with a free Pinlock anti fog insert. If you're after a great all-rounder then the Kabuto RT-33 has much to recommend it.